Your garage is stuffed to the max and you don’t think you can squeeze one more thing inside—including your vehicle. With cold weather on the horizon, it would be great to find space to store everything you need in your garage and still have room to park your car inside. If your garage is like most, there’s a good chance you can maximize your garage storage space with a just a little creativity and the right tools. Let’s review five tips for squeezing extra storage space out of your garage. A garage–consisting of three blank walls and a door—lacks the built-in storage options found inside your home. Without storage options, we resort to stacking items on the floor along the perimeter of the garage. Only, this gives us a limited amount of space. Once the perimeter space is taken, clutter marches toward the center of the garage. Before we realize it, the garage has been consumed by chaos, and we’re no longer able to park our vehicle(s) inside. The key to maximizing storage while conserving vehicle parking space is moving storage off the floor. Instead, utilize the most plentiful area by storing items along garage walls. Storing things along the wall makes sense, but you’re probably not thrilled about the idea of randomly hanging items all over your garage walls. Neither are we. Without a real system, randomly hanging items could leave you with a chaotic look and lots of unnecessary holes in the walls. Instead, we recommend using a garage wall organization system. Comprised of sturdy PVC panels that come in a variety of neutral colors, this system will be your new best friend. The beauty of these panels is their flexibility. Each panel has slots which accommodate corresponding storage accessories. This includes a wide range of camlock hooks, shelves, baskets and specialized hooks. Sturdy, lockable hooks and baskets stay put and are strong enough to hold heavy items. Rugged baskets and shelves come in multiple sizes, making it easy to find the right basket or shelf for the job. The system is scalable (start with one or two panels and expand later) and flexible enough to meet your family’s changing needs throughout the year. Just unlock baskets and hooks and take them down or move them elsewhere when the need arises. For additional storage space that is easily overlooked, just look up. The overhead space in a garage is rarely considered usable space. However, with the right tools, overhead space can provide a wealth of additional storage space. When installed by a knowledgeable, professional garage renovation expert, overhead garage storage racks provide a sturdy, safe place to store items seldom used. Accessible by step ladder, these racks are an ideal place to store seasonal items like holiday decorations. Combine overhead racks with plastic totes and you’ll be able to safely store lots of items that are commandeering space in your garage. Overhead racks are also ideal for storing bulky items that take up a lot of space. Just keep in mind that you’ll need to be able to carry the items safely up and down the step ladder to access them. There are a variety of specialized storage racks that can help you maximize storage in your garage. Overhead or wall bicycle racks allow you to store several bikes with limited or zero floor space. Hydraulic lifts can suspend lawn mowers, snow blowers or motorcycles, providing space underneath to park your vehicle. Snow tires, kayaks, snowboards, skis and rooftop sports equipment racks can all be stored overhead. 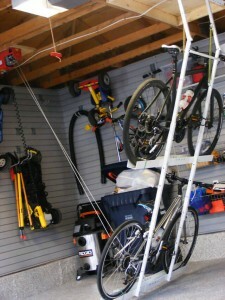 Specialized racks get the items off the garage floor, yet make them easily accessible when needed. Perhaps your garage has an odd configuration, a recessed wall or obstacles like a central vacuum cleaner to contend with. A professional garage renovation expert can assess the space with your family’s needs in mind and create a made-to-measure storage solution just for you. Unique, custom storage solutions can range from made-to-measure shelving to accommodate tight spaces or a curved wall; an overhead sling to store a canoe or other sports equipment; or a custom-built mezzanine to take advantage of a tall garage ceiling. Your garage contains a fixed amount of space. However, creative solutions and the right tools can help you wring every bit of available storage space from your garage. Hanging items on the walls reserves precious floor space. 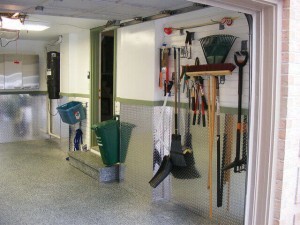 A garage wall organization system is scalable and flexible enough to accommodate your family’s changing storage needs. Overhead space can provide a treasure trove of storage for seasonal items. Specialized racks allow you to store several items in the space of one or without using any floor space at all. 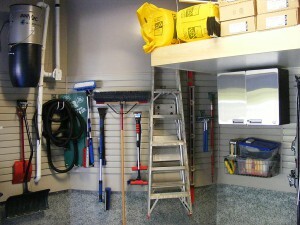 Made-to-measure storage solutions provide extra storage even in the tiniest of garages. Ready to squeeze the maximum storage from your garage? Request a free, in-house consultation.